Unearthed was sooooooo good! I went into it knowing next to nothing, only that I was in a sci-fi mood and I needed something action packed. This book delivered so hard. It’s set on another planet, and the two main characters basically have to go into an temple and try to find the secrets within. It sounds cliché, but it’s brilliant. The Uncharted/Tomb Raider vibes were real. I really liked both of the main characters, which hardly ever happens. Mia was a badass, and Jules was an adorable nerd. I loved that they were both on this planet to help their families. When it comes to books with dual points of view, I tend to gravitate towards the female but in this book I loved both of them and I really enjoyed reading from both of their perspectives. Occasionally, the points of view sounded and felt very similar, but I rarely got confused about whose POV I was reading from. As for the romance, I didn’t actually mind it! Either this means I’m growing as a person (yeah, right), or that it was written quite well. I don’t think there needed to be any kissing this early on in the series (it’s a duology) and I would have preferred a longer build up because I think that leads to the best tension, but it didn’t put me off the book or disgust me like it often does. Unearthed ends on the BEST cliffhanger I’ve read in ages. Like, I can’t remember the last time I read a cliffhanger this good. The ending was incredibly well done and I’m dying to read the second (and last) book in the series. I need to get my hands on it NOW. Somehow. With a time machine. I was left with so many theories that I need it right now to see if I’m right! 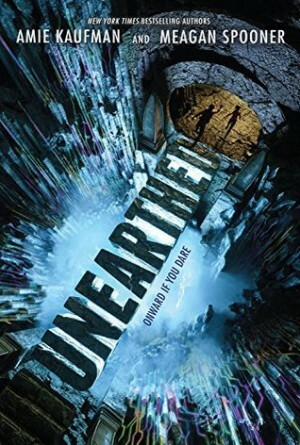 I’d highly recommend Unearthed, even if you didn’t like the authors’ previous work. It’s much stronger than These Broken Stars and the sequels, both in terms of writing and in pacing. Plus, there’s no instalove. Woo! My theory is that the undying are from the ship that was sent to Gaia, whose name I cannot currently recall. That after their last distress call to earth, they went through some sort of time portal (Black hole, singularity, what have you). And they want to take Earth back in revenge. I’m not sure yet how to explain their technology (are the people through the portals the original crew, or offspring? Would they have had hypersleep? Could they have developed new technologies in shifts then gone back into hypersleep? Could they have discovered some sort of alien tech? These are things I’m still pondering. I’m not sure offspring would have the same desire for revenge). That’s my theory for now. Sorry, not Gaia. The other planet they were trying to get to. My brain is tired.